Voltage Divider Calculator - Calculate the Resistor Values in the Two Resistor Voltage Divider Circuit. 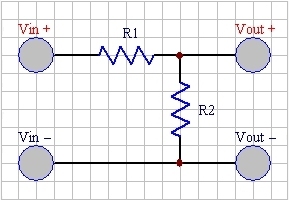 The two resistor voltage divider is one of the most basic and common circuits in electronics. It is often the first circuit a beginner learns. A voltage divider turns a large voltage into a smaller one. How it works is, the ratio of the resistors (R1 and R2) divides the input voltage down to a lower output voltage. The output voltage is a fraction of the input voltage, and that fraction is R2 divided by the sum of R1 + R2. The formula is VOUT = VIN * (R2 / (R1 + R2)). The voltage divider calculator assumes that you know any three values of the voltage divider circuit. Use the calculator below to compute the value of the missing parameter. Voltage dividers are commonly used for scaling down the voltage input to an ADC channel. For instance, if you want to read the voltage of a 12 volt power source but your ADC has a maximum input level of 5 volts, the voltage divider will scale the voltage down to a safe level. Many sensors are resistive and it's not possible for an ADC to get a proper reading from them. By adding a resistor to the resistive sensor, you create a voltage divider. Once the output of the voltage divider is known, you can calculate the resistance of the sensor. By using a voltage divider combined with an ADC all sorts of sensors can be read. Voltage divider circuits are not suited to step down the voltage for use as a power supply. Not only would it be terribly inefficient, enough current running through R1 would likely cause the resistor to burn up. As a rule of thumb, never use a voltage divider as a voltage supply for anything that requires even a modest amount of power. If you need to drop down a voltage to use it as a power supply, look into voltage regulators or switching power supplies. Also be sure to check out our Capacitor uF - nF - pF Conversion Tool to help you choose the correct capacitors for your next project.